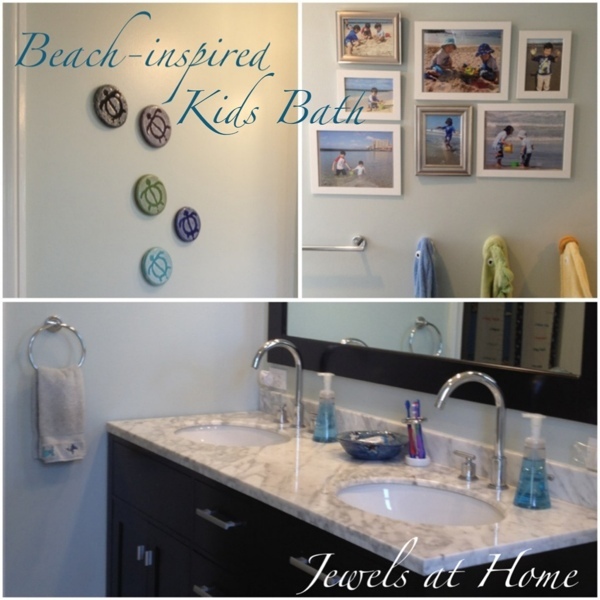 The kids/guest bath was a part of our big renovation when we moved into the house. 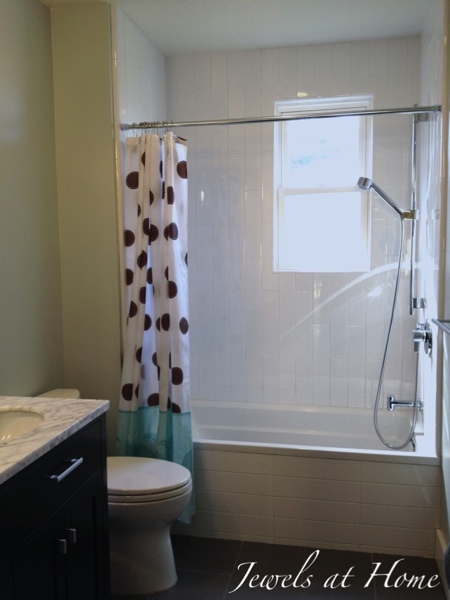 It was originally a Jack-and-Jill (aka Brady Bunch) bathroom with no tub, and like much of the house, it was pink! 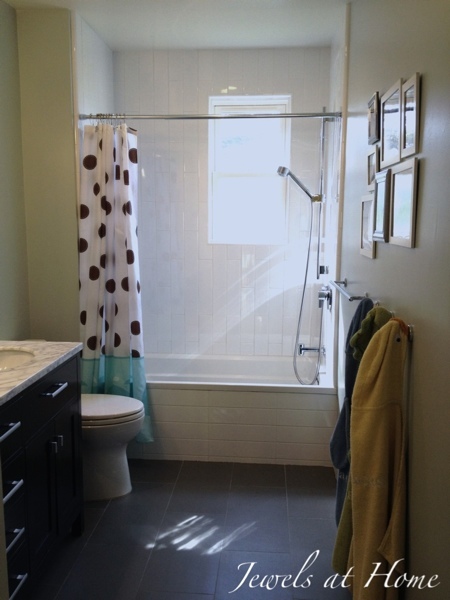 We wanted to turn it into a hall bath, which would be much more practical, especially because we were adding a new bedroom – the nursery – upstairs. The reconfigured area also allowed us to move the laundry up from the basement, which is vastly more convenient. 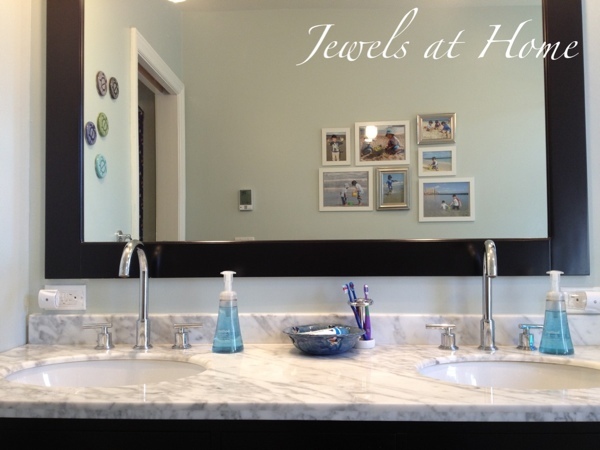 It’s a simple space with a feel that’s the perfect blend of classic and contemporary. Since its also a guest bath, and these little boys are fast becoming little men, I didn’t want to make the decor too cutesy. My original idea was to have a “Three Men in a Tub” theme, with a gallery of bath photos. 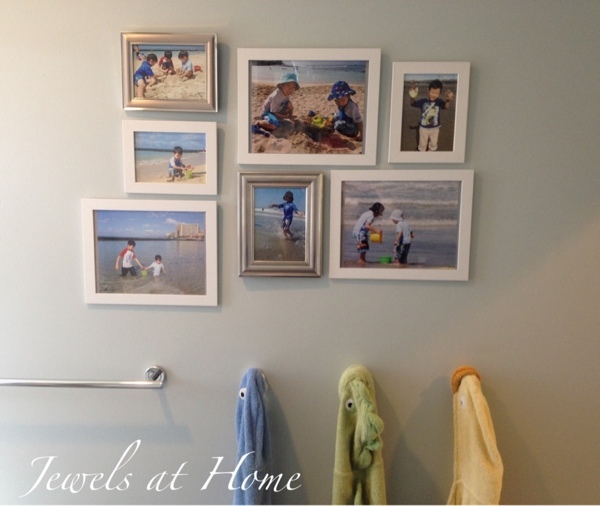 Wet babies are so adorable, so why not a gallery wall in the bathroom? I still love that idea, but with our recent vacation in Hawaii, I hit on a beach theme instead. 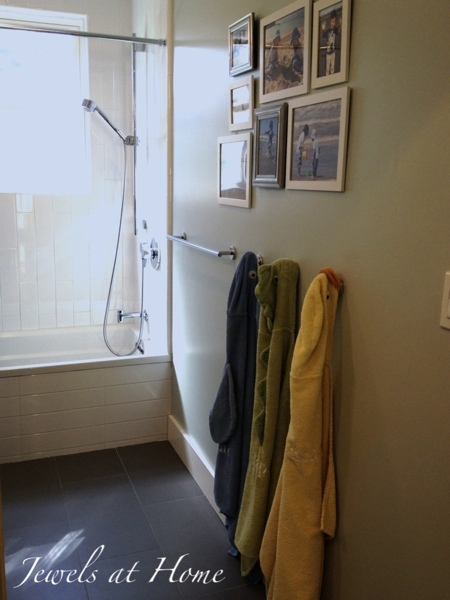 As for function, there’s a lot of practicality in this small space. 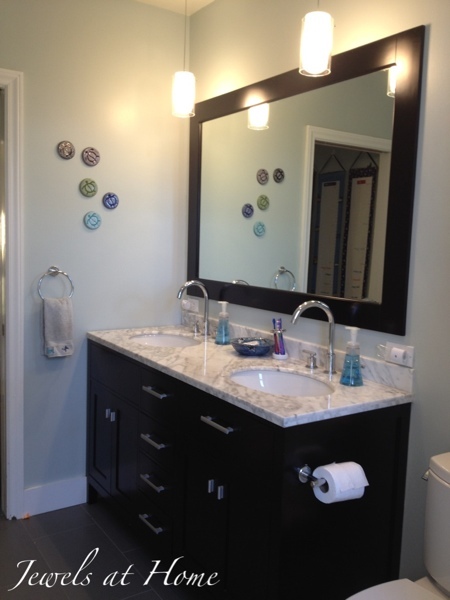 When the architect first proposed the double vanity for a kids bath, I wasn’t sure it was necessary, but hubby, who comes from a family of four kids, assured me it would be put to good use, and he was right! My kids never seem to successfully get their towels back on a towel bar, so I opted for these robe hooks. The adorable monogrammed hooded towels from Pottery Barn Kids were a gift from a dear friend when our youngest was born, and they fit perfectly here. The Hawaiian “honu” sea turtles were ceramic coasters I found at a crafts fair in Honolulu, and our little family adds some color and whimsy to this wall. 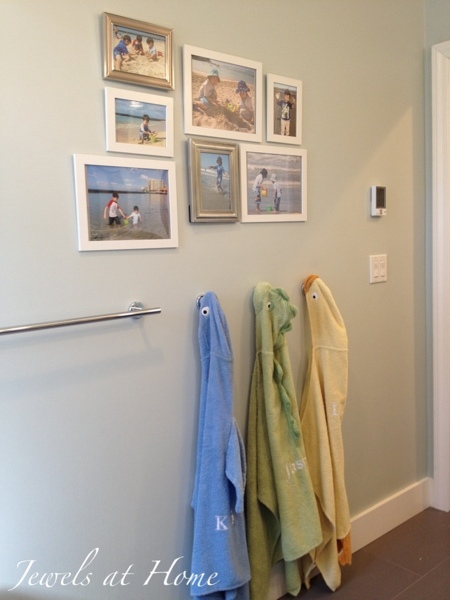 What color paint did you use in the walls in this beach bathroom? Hi! 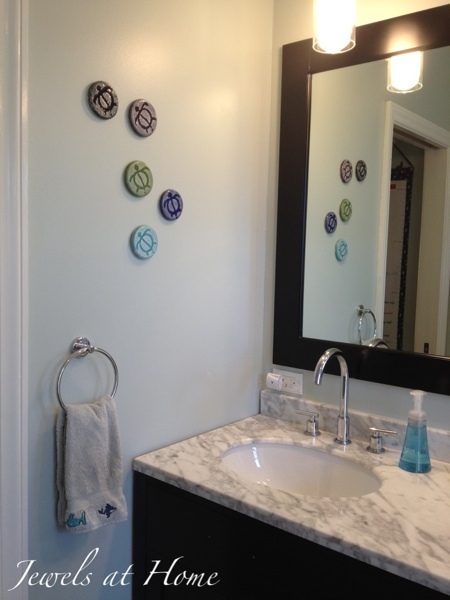 The wall color is Benjamin Moore 701 Swept Away.